Last month I went on my second trip to Koh Phangan (not for the full moon party but for the girls), so I have some up-to-date information, photos and videos for you. 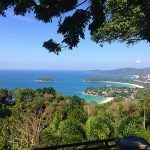 It’s actually more popular to do the full 3 island trip with Koh Samui, Koh Phangan and Koh Tao, but if you are like me and have already been to that area before and/or want to visit only Koh Phangan, then in this post I will show you how you can get there from Bangkok. Important: Unlike on Koh Samui, there is no airport on Koh Phangan. 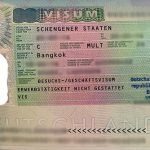 Depending on if you fly to Surat Thani, Koh Samui or Chumphon or if you take the train there, it will take you between 3 and 15 hours and cost between 1,100 and 3,500 Baht (one way). In my opinion the best travel option: I booked my flight with AirAsia directly to Koh Phangan. The standard fare is around 1,700 Baht one way, but they often have promo fares for 1,390 Baht. 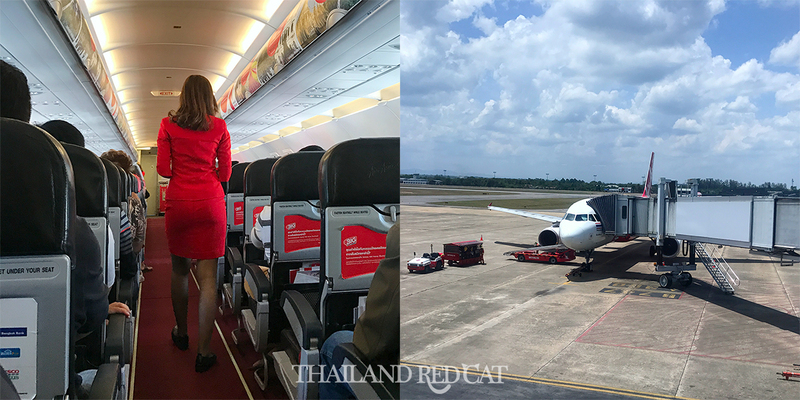 The flight from Bangkok to Surat Thani takes just about 70 minutes, and like so often, the views inside the aircraft are better than out of the window. Once you have reached Surat Thani Airport, you will switch to a bus that brings you to Don Sak Pier. The ride takes about 90 minutes. As soon as you arrive there, walk inside and show your ticket or itinerary to the friendly ladyboy, who will check off your name and give you the ferry ticket. 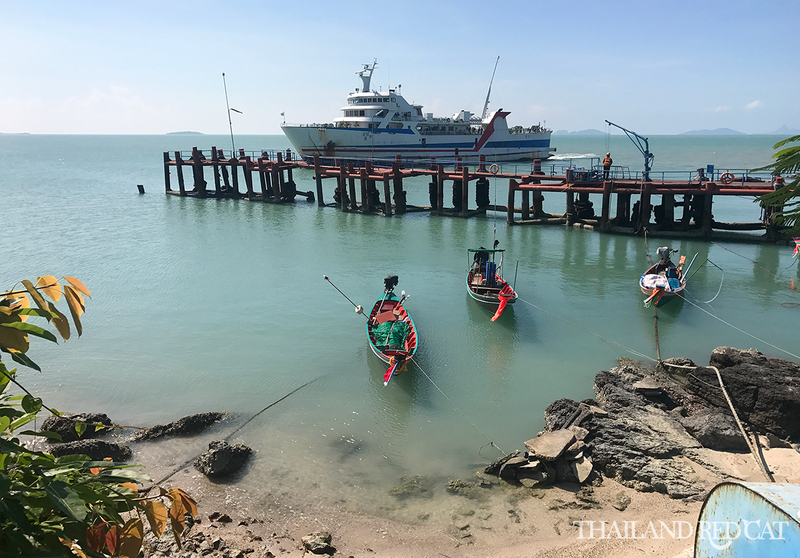 Expect to wait at least 1 hour, often even close to 2 hours at Don Sak Pier for the ferry to Koh Phangan. I think they organize it that way so that if the flight from Bangkok has a delay, you will not miss the ferry. The good news is that they have some tasty rice dishes at the coffee shop for 50 Baht. And the views in the waiting area at Don Sak Pier aren’t bad either. There are seating areas both inside (air conditioned) and outside. Unless you are traveling at noon, the atmosphere is obviously much nicer outside. The boat is not too full with passengers either (unless you are traveling just before full moon) and there is always a nice and refreshing breeze. The ferry ride to Koh Phangan takes about 2-2.5 hours. Once you have arrived, you can take a Songthaew to your hotel. No matter if you stay in Thong Sala or Haad Rin (the two main tourist areas), the fare is always 100 Baht. Yes, that’s expensive, and you might as well just rent a motorbike in the town of Thong Sala itself (250 Baht per 24 hours for a standard scooter). 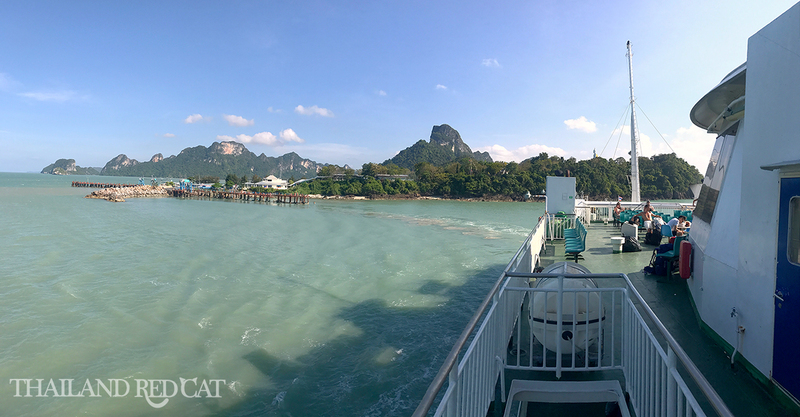 An even quicker but more expensive travel option is to fly from Bangkok directly to Koh Samui and then take a ferry to Koh Phangan. The problem with that is that there are only few airlines operating on the Bangkok-Samui route (like Bangkok Airways), means the prices are quite high (about 3,000 Baht one way). After you have landed on Koh Samui, you can take a taxi or songthaew to Bangrak Pier (200/100 Baht) and from there a ferry to Thong Sala on Koh Phangan (300 Baht). I don’t really recommend going this route, unless you are going for the full moon party and the tickets for the first option (see above) are fully booked or too expensive. You can either fly there with NokAir (1 hour, 1,300-1,500 Baht one way) or take a train (8-9 hours, 82 Baht for 3rd class, 190 Baht for 2nd class and 394 Baht for 1st class). At the airport or at the train station, you can book your ferry ticket (see info below) which will include the transfer to the pier. Unfortunately there is no direct ferry connection from Chumphon to Koh Phangan. 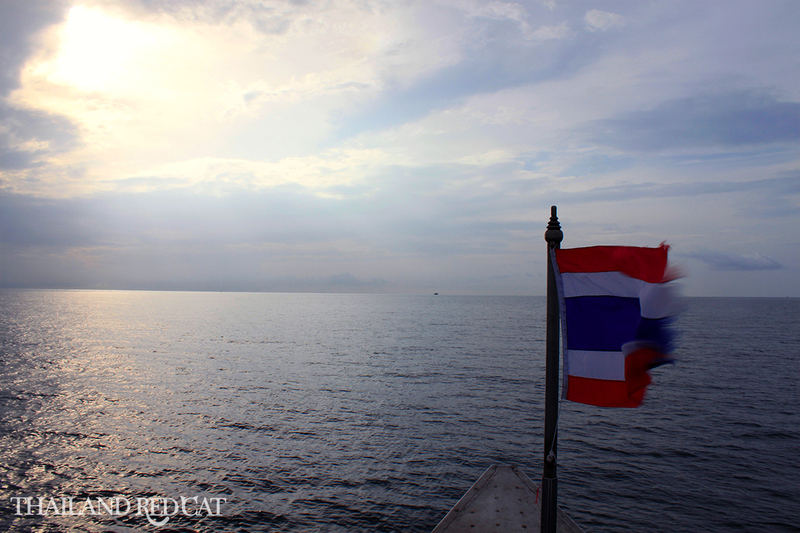 All boats cruise to Koh Tao first, and after about 30 minutes they continue to Koh Phangan. I’ve done that trip a few years ago (the picture is taken in the early morning after I have arrived in Chumphon with the night train), but that time I spent a few nights on Koh Tao. If you want to go directly to Koh Phangan, you better choose the all-inclusive option with AirAsia via Surat Thani. The ferry ticket from Chumphon to Koh Phangan costs 1,000 Baht, and the trip takes about 3 hours and 45 minutes. That makes a total travel time of about 7 hours if you fly to Chumphon, or about 14.5-15 hours if you take the train to Chumphon.